The Toronto Maple Leafs announced on Tuesday, March 6 that centre Mikhail Grabovski signed a 5-year extension with the club (salary not released but rumoured to be about $27.5M). The deal is not a surprise, as General Manager Brian Burke had announced on NHL Trade Deadline Day that the team was not shopping the player and had every reason to believe a deal on an extension would be reached. The 27-year-old, German-born Belarusian has evolved into a consistent 55-60 point producer and is regarded by many as the best centre currently on the Leaf team. The Grabovski extension is the second major extension announced by the franchise this season, following the 4-year deal agreed to with defenceman John-Michael Liles. It reduces the number of unrestricted free agent contracts expiring at the end of the 2011-12 season to six, to go with 13 restricted free agents among Toronto’s 50 professional contracts. It also comes quick on the heels of the firing of Ron Wilson and hiring of Randy Carlyle as head coach. Grabovski was acquired from Montreal on July 3, 2008 by interim-GM Cliff Fletcher in exchange for Greg Pateryn and Toronto’s second round draft choice in 2010 (that pick eventually was traded to Chicago, reacquired by Toronto, and traded to Boston in the Phil Kessel deal, which Boston used to select Jared Knight). In 2010-11, Grabbo set career highs of 29 goals and 29 assists for 58 points. In 59 games this season, he has 20 goals and 25 assists – including the recent 2-goal effort against his former team on Saturday night to help give coach Carlyle his first Toronto win. In addition to his numbers, observers have remarked that Mikhail’s game has matured significantly in Toronto. The Leafs are thin at the centre position, and Grabovski was regarded as almost a ‘must-sign’ for the team in order to avoid creating a complete crisis for the offence. Further, he himself had expressed his desire to remain in Toronto with his wife and 2 young children. 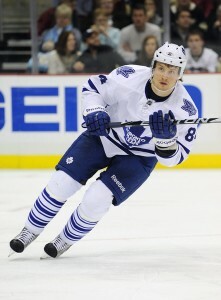 Grabovski was named the NHL First Star of the week on Monday January 30, 2012. Some fans were unhappy that Burke was unable to make any ‘significant’ deals at the deadline. Yet the GM felt that there was no deal to be made, that he was not interested in shipping players out in return for draft picks. That included a rumoured first round draft choice for Grabovski. It has become clear that despite criticisms, and the reminders of previous pronouncements, Burke has decided on his core group, and he’s going to proceed with his plan. It is apparent the Leafs are not a solid playoff team. That fact is not lost on Burke, though he would likely argue that his team is young and will develop into such a team. Certainly, that’s not to say Burke wouldn’t entertain trades, even of players who have multiple years remaining on their contracts. The key factor would be if such a trade would result in an upgrade without creating further needs. The team will continue to seek size for its forward lines, but this contract extension signals that management is pleased with Grabovski’s emergence as a top-6 forward, one who will anchor the second line. Coach Carlyle praised Grabovski following the game in Montreal, citing his perseverance and ability to play big despite his small stature. Among players currently on Toronto’s NHL roster, Joey Crabb and Jonas Gustavsson are UFAs, while Cody Franson, Nik Kulemin and Matt Frattin are RFAs. Today’s signing of Grabovski means he joins Liles, Phil Kessel, Mike Brown, James Reimer, Dion Phaneuf, Mike Komisarek, Luke Schenn and Jake Gardiner in a group signed at least until the end of 2013-14.